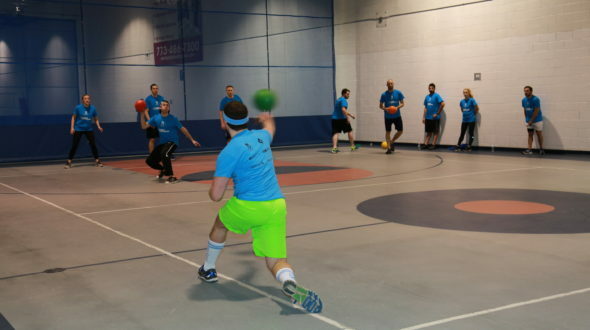 Surprise snowfall did not deter members of Chicago’s trading community from participating in our first-ever Traders’ Dodgeball Tournament at Windy City Fieldhouse on March 14, 2017. In partnership with Belvedere Trading and LTS Chicago, Urban Initiatives hosted a dodgeball tournament designed to bring members from different trading companies together in support of a great cause. The six teams vying for the championship were: Belvedere Trading, Chicago Trading Company, Consolidated Trading, IMC, Optiver, and PEAK6. Competition was fierce, and dodgeballs flew across the court at impressive speeds and the traders demonstrated their prowess in strategizing, teamwork, and evading dodgeballs. After a hard-fought tournament, Chicago Trading Company defeated Consolidated Trading in the finals to take home The Golden Dodgeball and bragging rights as the first-ever Traders’ Dodgeball Tournament Champions. A huge thank you to Belvedere Trading, LTS Chicago and Mark Biery, and all the trading firms for their enthusiasm, participation, great sportsmanship, and generous support.